Assistant Minister for Education and Training, Senator the Hon Simon Birmingham, attended the inaugural meeting of the newly established Australian Industry and Skills Committee (AISC) on 9 June 2015. The AISC replaces a number of existing committees and its formation is an important milestone in the Council of Australian Governments (COAG) Industry and Skills Council’s commitment to streamline governance arrangements for the vocational education and training (VET) sector. Read more about the Australian Government’s VET reform and the new committee in the Assistant Minister’s Media Release. The six organisations that will make up the new Industry Skills Fund (ISF) Skills Adviser Network have been announced. Assistant Minister for Education and Training, Senator the Hon Simon Birmingham, said the ISF Skills Adviser Network would invest $43 million over the next three years to provide intensive support to businesses that are looking to grow and develop their workforce. Read more about the Adviser Network. The Australian Government is making it easier for employers to recruit, train and retain Australian Apprentices. Announced by the Prime Minister on 8 September 2014, the new Australian Apprenticeship Support Network (Apprenticeship Network) replaced Australian Apprenticeships Centres in all states and territories on 1 July 2015. The Apprenticeship Network introduces next-generation service streams, structural changes and operational supports to better meet client needs and realise efficiencies. Importantly new Apprenticeship Network services will cover the whole apprenticeship lifecycle – from pre-commencement to completion. The Australian Government is committed to building a high quality system which better supports apprentices and responds to the needs of employers and the economy. If you have more questions please refer to the frequently asked questions on the Australian Apprenticeships website or call the Australian Apprenticeships Referral line on 13 38 73. The Australian Apprenticeships and Traineeships Information Service has launched a new resource that aims to help students and jobseekers identify the strength of their career interests. The resource provides statements illustrating characteristics of seven broad work types. People respond to these based on their level of interest resulting in a listing of work types according to the relative strength of interest. From these outcomes, people can search for related information based on specific occupation ideas or industry-based career information available on the Australian Apprenticeships Pathways website. The resource will help people refine their thinking about their potential career pathways. It can also be part of their careers-related discussions with the Australian Apprenticeship Support Network and other service providers such as careers advisers in schools. This new resource has been developed by the Australian Apprenticeships and Traineeships Information Service and the Career Education Association of Victoria, with funding from the Australian Department of Education and Training. The Career Interest Explorer is available on the Australian Apprenticeships Pathways website. The VET Guidelines 2015 have been updated to support the next tranche of VET FEE HELP Reforms which came into effect on 1 July 2015. Further measures will commence on 1 January 2016 allowing VET providers a transition period to alter publications, systems and processes. More information is in the July edition of the HELP newsletter HELP newsletter. Included in this edition are articles about filling out the Request for a VET FEE-HELP loan form (that came into effect on 1 June), the VET FEE HELP Reforms – stakeholder consultation sessions that were held in April and May, and details about the VET FEE-HELP Reforms implemented on 1 July 2015, and to commence on 1 January 2016. In addition, details of the amendments are in the Addendum to the VET Administrative Information for Providers. The Addendum incorporates the VET FEE-HELP reforms over 2015/16 and has been published to assist VET providers with implementing the reforms, and will be updated on an ongoing basis. For more information, please email TSEnquiries@education.gov.au. Please join the Australian Vocational Education and Training sector on 19 November in Hobart for the 2015 Australian Training Awards. Hosted by Senator, the Hon Simon Birmingham, Assistant Minister for Education and Training, the Awards recognise individuals, businesses and registered training organisations for their significant contribution to skilling Australia. Entries for 2015 state and territory training awards have now closed, with finalists being announced over the coming months. Visit the state and territory training awards web page for finalist announcements and event dates. 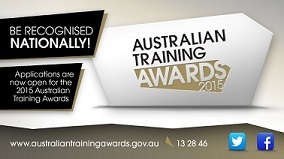 Direct entry category finalists of the Australian Training Awards will be announced in August. The Unique Student Identifier (USI) – Are you connected? Most of Australia’s Registered Training Organisations (RTOs) are connected to the USI Registry System for seamless process integration and easier handling of large student numbers. • develops smarter evidence-based regulation to support greater efficiency for RTOs when interacting with governments and regulators. Unless a specific exemption applies, RTOs are required to collect and verify a student’s USI before they can issue a qualification or Statement of Attainment. This can be done in one streamlined process as system-to-system connectivity between an RTO’s student management system and the USI Registry System enables RTOs, with a student’s permission, to create and verify USIs through their own system. Connection with the USI Registry System saves RTOs time in reporting, right from the beginning. Being connected also means RTOs can submit and retrieve bulk USI creations. In addition, the new ‘Locate USI function’ is one of the recent enhancements to the USI Registry System. This functionality allows RTOs to assist a student who has forgotten their USI. It should also be noted that a student can retrieve a forgotten USI themselves via the USI website. Read more about forgotten USIs here. If you have not already done so, get connected today! For simple instructions on how to connect with the USI Registry System, RTOs can access the USI User Guide. Stay up to date with the latest news on the USI website. You can contact the USI Office for further information via our chat functions. Alternatively, give us a call on 13 38 73 or email us at usi@education.gov.au. The Migrant Skills Recognition Service (MSRS) was a pilot program funded by the Australian Government designed to assist refugees or vulnerable migrants with trade experience or qualifications achieve a Certificate III in their trade to improve their employment opportunities in Australia. As part of the pilot program, VETASSESS developed a customised gap training and assessment model in partnership with Western Sydney Institute (WSI) to deliver hairdressing and beauty qualifications in NSW, and with Bendigo/Kangan Institute (BKI) to deliver engineering and welding qualifications in Victoria. On 10 June 2015, a graduation ceremony was held in Sydney for nine hairdressers and three beauty therapists assessed by WSI who had achieved their full Certificate III. Six hairdressing applicants have secured employment in salons in and around Sydney, one is being interviewed by a salon for a permanent position and the other five applicants intend to enrol in further studies at the Diploma level. Fifteen welders assessed by BKI will be graduating on the 30 June 2015 in Melbourne with their full Certificate III engineering qualification. WorldSkills Australia’s Skillaroos team is just one short month away from jetting off to Brazil for the 43rd WorldSkills Competition. Held from 11-16 August at the Anhembi Exhibition Centre in São Paulo, the team’s 25 talented young men and women will compete against the world’s best in their respective skill categories in the hopes of being named World Champions. Learn more about the Skillaroos by checking out their vblogs on the WorldSkills Australia YouTube Channel. You can also show your support for the Skillaroos by sending them a personal message. Messages can be e-mailed to WorldSkills at dlasalle@worldskills.org.au. A forum in Sydney on 27 May 2015 heard leaders from the Muslim and Indigenous communities speak about using the strenths of people from different backgrounds to build a stronger Australia. Watch the video or read the media release for more details of the Forum. In February this year, Assistant Minister for Education and Training, Senator the Hon Simon Birmingham, launched New Retail Series, innovative new training programs to address skills shortages in retailing. The series, being piloted by the Australian Retailers Association Retail Institute, was conceived by Service Skills Australia and developed in close collaboration with industry. The first series, Merchandise Management, took place over four months and wrapped up on 29 May. The second series, Online Retailing, started on 22 June. Read about the Merchandise Management participants in Fashion Buying About More Than Picking Out Pretty Outfits and No Two Days the Same in Retail Buying. On June 16 2015, a Special General Meeting held at SkillsDMC’s offices saw former SkillsDMC Chief Executive Officer, Steve McDonald, and Nigel Carpenter, Chief Executive Officer of the Australian Drilling Industry Association, appointed following a unanimous vote as Independent Chair and Independent Director respectively. Read more here. IBSA’s Workforce Development team is pleased to announce the release of several new resources for the Financial Services, Printing and Business Services Industries. Download these publications from IBSA’s website. • discuss frequently asked questions. For dates and locations, and to reserve your place, visit the CS&HISC website. Enjoy the following stories of lives changed through vocational education and training. Richard Wilkinson obtained a Bachelor of Environmental Design and a Bachelor of Architecture with Honours from the University of Tasmania. On completion of his studies he worked for three years as a graduate architect with Troppo Architects, the third most awarded company in Australia. At the age of 27, with a desire to move away from a full time desk job, Richard decided to learn the practical skills behind what he was drawing and took up an Australian Apprenticeship in Carpentry. His mature-aged Apprenticeship began in 2011 with Perry and Perry Builders, and it allowed him to embrace his real passion of being involved in the building and application of the plans, as opposed to just drawing them. Richard’s now working towards his Certificate IV in Building and Construction and dreams of owning his own business that combines designing of client’s dream homes with building those homes. 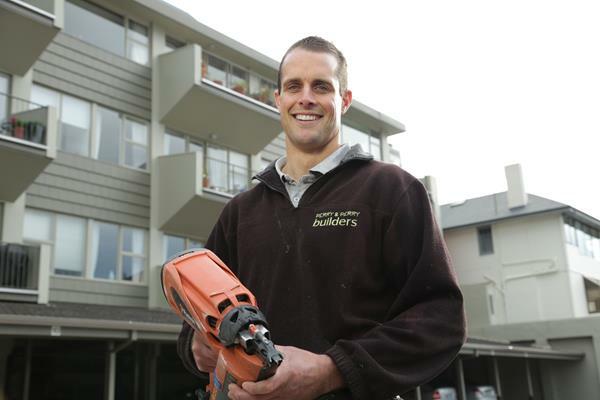 Richard was Tasmanian Australian Apprentice of the Year in 2014 and recently became an Australian Apprenticeship Ambassador. Read more of his story here. Markeeta Douglas’ interest in audiometry started at a young age, having suffered from ear infections for most of her childhood. Her interest was re-ignited when her four-year-old son was to undergo surgery for a serious middle ear infection. Markeeta enroled at TAFE NSW – Western Sydney Institute to complete a Certificate IV in Audiometry, studying by distance education through WSI’s Open Training and Education Network (OTEN). The 30-year-old believes her training has opened up many opportunities for her to boost the health of local Aboriginal people. Markeeta is now employed as an audiometrist at the Awabakal Cooperative in Newcastle and uses her experience to promote vocational education and training as a pathway to learning and career progression, and the importance of education and health in the Aboriginal community. Her outstanding efforts in her studies saw her win the coveted Aboriginal and Torres Strait Islander of the Year at the 2013 Australian Training Awards. Read more about Markeeta’s experiences with vocational education and training. The Oothungs (Sisters) in Mining Program is a unique four-week pre-employment programme for Indigenous women in Central Queensland. 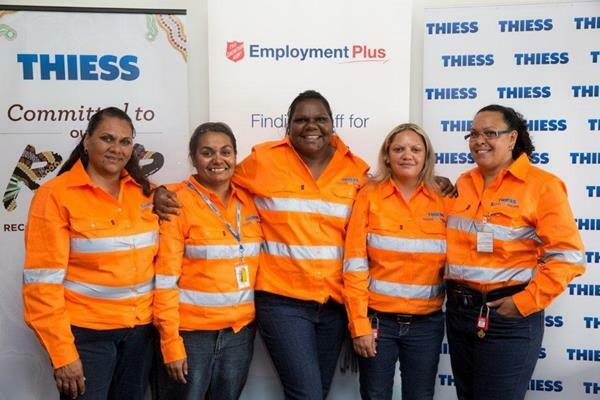 This collaboration between Thiess, Wesfarmers Curragh and The Salvation Army Employment Plus, developed with engagement from a range of community organisations and traditional owners of the land, was formed to assist local unemployed Indigenous women enter Queensland’s mining industry. Following completion of the programme, the women undertake a competency-based traineeship, contributing to a nationally recognised Certificate II in Surface Mine Extraction Operations and a permanent, full-time position as a haul truck operator. Based on the success of a 2010 pilot with six Indigenous women participating, the current programme was launched in 2013. The pre-employment programme has since been replicated at two coal mines. Since forming the collaboration, the Program has created a sustainable entry pathway for Indigenous women into the mining industry and has helped build a more diverse and inclusive culture in Queensland’s mining industry. The Oothung Sisters won the Australian Training Awards’ Industry Collaboration Award in 2014. Read more about the programme. FURNITEX connect will be held at the Royal Exhibition Building, Carlton Gardens, with registrations for the furnishing industry’s most prestigious annual event now open for those wanting privileged insights into Australia’s furniture design and innovation future. An exceptional list of confirmed speakers includes: Dr Bronwyn Evans, Standards Australia; Peter Roberts; Australian Manufacturing Forum; Dr Swee Mak, RMIT; Ben Batagol, Amaero Additive Manufacturing, and Peter Mclean, Development Impacts. A reminder that nominations for this award will close on 29 July 2015. Information about the Award and the official application form are available on the UNESCO Bangkok Office website. 1 August 2015 - applications for the 2016 Fulbright Scholarship round will close. The Australian-American Fulbright Commission promotes and supports educational and cultural exchange between Australia and the United States of America. This is primarily achieved through the administration of Fulbright Scholarships to support students and scholars – chosen for their academic merit and leadership potential – to research and study in each other’s countries, exchange ideas and develop bilateral relations and connections to address common issues. One category of these scholarships, the ‘Professional Scholarships’ includes the Fulbright Professional Scholarship in Vocational Education and Training, sponsored by the Department of Education and Training. This Fulbright Scholarship is for employees within the vocational education and training (VET) sector or training leaders in business and industry. It is not for university academics who study VET as an academic discipline. • people who are leading vocational education and training strategies within their business. • staff within universities who teach in the training/skills sector of a university. The prestigious Fulbright program is the largest education scholarship of its kind, created by US Senator J William Fulbright and the US Government in 1946. It operates between the US and 155 other countries, aiming to promote mutual understanding through educational and cultural exchange. Visit the Fulbright website for more information. National Skills Week highlights the talents, skills, career pathways and value of apprentices and trainees to employers and the broader Australian public. Now in its fifth year, the week is dedicated to raising the status of practical and vocational learning. The program will explore a range of topics, including fostering industry engagement, market approach to vocational education and training, quality and capability, higher education in TAFE-mission creep?, internationalising vocational education qualifications, vocational education and training pedagogy and servicing regional communities. Join managing directors and senior staff from TAFE providers nationally, along with industry and government partners and international delegates. Over 400 delegates attended last year in Sydney and the conference generated considerable interest from national and state media. Earlybird and Group discounts are ONLY available until midnight on Thursday July 16 (AEST). Visit the TDA website for more information. Registration is open for Velg Training’s 2015 National VET Conference, which will be delivered over two days, providing attendees with the opportunity to engage in a wide variety of plenary, elective and master class sessions and to meet with product and service providers and network with peers from across Australia. The theme for this year’s conference is Reconnecting VET and will focus on three distinct streams including Policy & Reform, RTO Management & Compliance and Training & Assessing. Three new streams dedicated to RTO Administration, VET Shapers and Trainning Packages have been added this year. Northern Territory – the NT finalists have been announced. Read their profiles here. • integrating your business and learning management systems. • engage actively with the Australian Government on policy issues as part of a better, more informed and representative dialogue between women and government. If you would like to provide feedback, supply an article for inclusion in the next edition or join our list of subscribers, please email skillsatwork@education.gov.au. The next edition will be published in August 2015. Submissions are due by Friday 17 July 2015.